All motor vehicles must be titled and registered before driven on the roads and highways of Nebraska. Vehicles are registered at the Motor Vehicle Office in the county where the applicant resides. Registrations in the State of Nebraska are issued at the Motor Vehicle Office in the county where the applicant resides. All motor vehicles registered in Nebraska are issued two license plates, to be displayed on the front and back of the vehicle. One license plate is issued for apportionable vehicles, buses, dealers, minitrucks, motorcycles, special interest motor vehicles, trailers, and truck-tractors. If your license plates or validation stickers are lost, stolen, or damaged, you may apply for a replacement at your local county treasurer’s office or contact the Nebraska DMV at (402) 471-3918. You may transfer your old license plates to a new vehicle that is registered in your name, your spouse’s name, or your domestic partner’s name. Buying a used car in Nebraska? Don’t make a costly mistake. Run a Free License Plate Lookup for your Nebraska-registered vehicle! 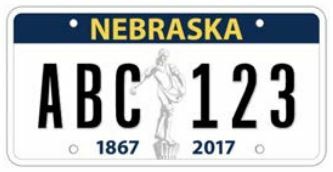 Run a Free Nebraska License Plate Lookup to uncover the full-story of your Nebraska-registered vehicle.